The United States Federal Communications Commission (FCC) voted along party lines – three Republicans vs two Democrats to end Net Neutrality and the principle of a free internet that everyone can access equally. – A principle that heralded an era of innovation, freedom of speech and new forms of communication and social organisation predicated on everybody’s voice being able to be heard equally online. The Chairman of the FCC Ajit Pai had been appointed by President Trump, an opponent of Net Neutrality. So are some of the big internet service providers who spent tens of millions lobbying for this decision despite 80% of the US public opposing it, as they will be free to charge different prices for different types of content now. But already many states have vowed to fight the decision in the courts. California, Delaware, Hawaii, Illinois, Iowa, Kentucky, Maine, Maryland, Massachusetts, Mississippi, New York, North Carolina, Oregon, Pennsylvania, Vermont, Virginia and Washington all immediately vowed to sue Trump’s FCC. For now the freedom of the Internet in the UK is safe as we are still bound by EU principles of Net Neutrality. But depending on how the fight goes in the USA, there may well be a knock on effect on Internet freedom around the world. The repeal of the 2015 rules could mean the internet has slower and faster lanes depending on who is providing content or how much people are willing to pay for fast internet provision. The FCC just voted to hand control of the internet over to giant internet companies, but this isn’t over. Congress must step up to repeal this rule, restore net neutrality protections, and defend a fair and open internet. Democrat FCC commissioner Jessica Rosenworcel, who voted against the three Republican commissioners led by Ajit Pai said he had presided over a “corrupt process,” and exhibited “contempt and sheer disdain” for the public. 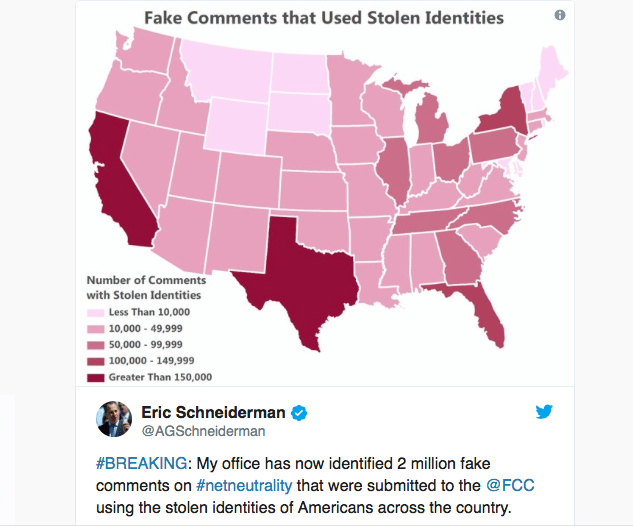 “As many as 2 million comments” on the US Federal Communications Commission’s proposal had been discovered to have been faked, the office of the attorney general of New York had revealed, and he had called for the process to halted while it was investigated how identities of real living and dead people been falsely used to create an impression that there was public support for the move. But there was widespread criticism from some of the internet’s biggest innovators. Streaming giant Netflix called the move “misguided”, and said it stood with innovators in fighting it. “Today’s vote is the beginning, not the end. While the fight to preserve net neutrality is going to be longer than we had hoped, this is far from over,” they said in a statement on reddit. Respected tech news network The Register called FCC chairman Ajit Pai the Martin Shkreli of technology policy, referring to the deluded criminal profiteer from HIV medicaments. “In a clear reflection of the lowest-common denominator approach adopted by Donald Trump in his presidential campaign, Pai has relied on mockery and disparagement as way to push back on sincerely held concerns.